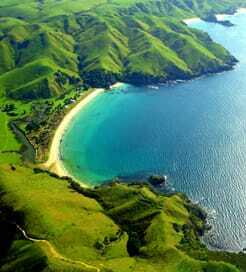 New Zealand can be found on the south east side of Australia and is made up of two main islands and a number of smaller islands. The two main islands known as the North Island and South Island are separated by the Cook Strait. The five largest inhabited islands aside from the main 2 are Stewart Island, the Chatham Islands, Great Barrier Island, d'Urville Island and Waiheke Island. The South Island is the largest landmass of New Zealand, and is divided along its length by the Southern Alps. The North Island is less mountainous but is marked by seismic activity. New Zealand is a land of magnificent beauty and contrasts. Nature reigns supreme. Unspoilt coastlines, lush vegetation, amazing wildlife and a moderate climate make it ideal for visitors wanting to enjoy the outdoors or simply relax. The country's dynamic culture has European, Maori, Pacific and Asian influences. The Kiwis, as the New Zealanders are well known as, are a hospitable and friendly bunch. New Zealand features in the top ten of places travellers would like to visit and chances are you've never meet anyone who has been and didn't love the place. In terms of ferry travel, the two main islands are connected by a ninety kilometre service across the Cook strait. The ferry journey itself is widely acknowledged one of New Zealand's most iconic sightseeing experiences. For more information, please visit our Ferries from Great Barrier Island to New Zealand page. For more information, please visit our Ferries from Motutapu Island to New Zealand page. For more information, please visit our Ferries from Stewart Island to New Zealand page. For more information, please visit our Ferries from Rangitoto Island to New Zealand page. For more information, please visit our Ferries from Waiheke Island to New Zealand page.